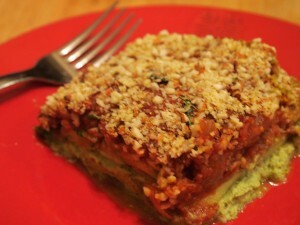 This lasagna achieves nutrient density with fresh seasonal vegetables and without the heavy, cheesy, saltiness might be associated with other lasagnas. It also uses zucchini “noodles” in place of pasta and finely chopped eggplant in place of ground beef. If you freeze this dish, allow the lasagna to thaw completely at room temperature then reheat, covered, at 350 degrees Fahrenheit for 15-20 minutes. To prepare the marinara sauce, heat 2 tablespoons of olive oil in a large skillet. Sauté onions and 1/3 of the minced garlic over medium heat until the onions are tender and slightly browned, about 5 minutes. Add the processed eggplant to the sauté and continue cooking for a minute. Add stewed tomatoes, tomato sauce, balsamic vinegar, and water. Turn to low heat and allow to simmer until the eggplant is thoroughly softened and most of the liquid has reduced. While the sauce is simmering prepare the pesto. Combine tofu, basil, 4 tablespoons olive oil, lemon juice, and one clove of garlic in a large blender or food processor until it is smooth and creamy. When the sauce is ready it is time to assemble the lasagna. Spread ½ a cup of sauce on the bottom of a large glass (Pyrex) baking dish. Create an even layer of zucchini noodles on top of the sauce using 1/3 of the zucchini noodles. Add the tofu pesto in an even layer over the zucchini and layer another 1/3 of the zucchini noodles on top of the pesto. Spread another cup of the sauce on top of the zucchini, followed by the remainder of the noodles. Top it off with the rest of the sauce and bake in the oven at 400 degrees Fahrenheit for 20 minutes. While the lasagna is cooking prepare the topping. Combine ¼ cup of almonds, nutritional yeast, and a pinch of salt in a food processor until it is uniformly ground. After the lasagna has cooked, allow it cool for 10 minutes then sprinkle the topping on top in a uniform layer. Serve warm.